This week has found us signing a new rental agreement and beginning to pack up our home. We are renters for the time being, and when we moved into our current home, we moved here for Caemon. The three bedrooms, the nice little yard, the space for running around all were draws for a family with a little boy to raise. With Caemon’s death, however, we find it so impossible to be here. We keep the door to his bedroom closed at all times and only briefly step in to deposit something and then close the door. We see him everywhere here: the dining room which houses his little play kitchen as well as our big family table where he liked to sit on a bench, the living room where he enjoyed helping to make fires in our stove or sit with me in the rocking chair reading books, the back yard where he would dig and plant and catch garter snakes and make mud pies, the kitchen where he would pull up his stool to help us make coffee or muffins or hummus and where he fell in love with all our appliances, even our garage where he liked to get into my tools or hang out with the vacuum cleaner. This place is loaded with Caemon memories, and it’s hard to leave them behind, but in order to move forward, Jodi and I need to be in a space where we don’t expect to see Caemon running toward us when we walk through the door or stumbling down the hall when he awakes in the night. We need a bit of a blank slate. Of course, moving also pushes us into perhaps the most dreaded of activities after losing a child: the sorting of his things. Because we had put in new flooring in anticipation of Caemon’s homecoming, Caemon’s room never really came back together. His bed is not there, and there are just piles of his toys and clothes and books stacked, including all the boxes of generously donated items meant to make his year in isolation more enriching. His clothing has been in large sealed ziplock bags, which we had to use when transporting his clothing from the laundry to his room in BMT to keep dust and germs out. It has been a mess that neither of us has felt we could endure, but we knew we would have to tackle it soon, and likely with the help of many friends holding our hands through each step in the tear-soaked process. Then came yesterday. Jodi was having a conversation with one of Caemon’s favorite nurses online. She is volunteering at an orphanage in Tanzania, and they were discussing her experience. Within minutes, Jodi was telling me that the baby home needed boys’ clothes. After a few more moments passed, we were discussing how we would get the clothes there, and within half an hour, Jodi had opened the door to Caemon’s room, pulled out a suitcase, and we were sitting on his floor, sorting through his clothes, packing them up to send to these kids who need them so much. It all felt so right. Caemon loved it when the red suitcases came out. 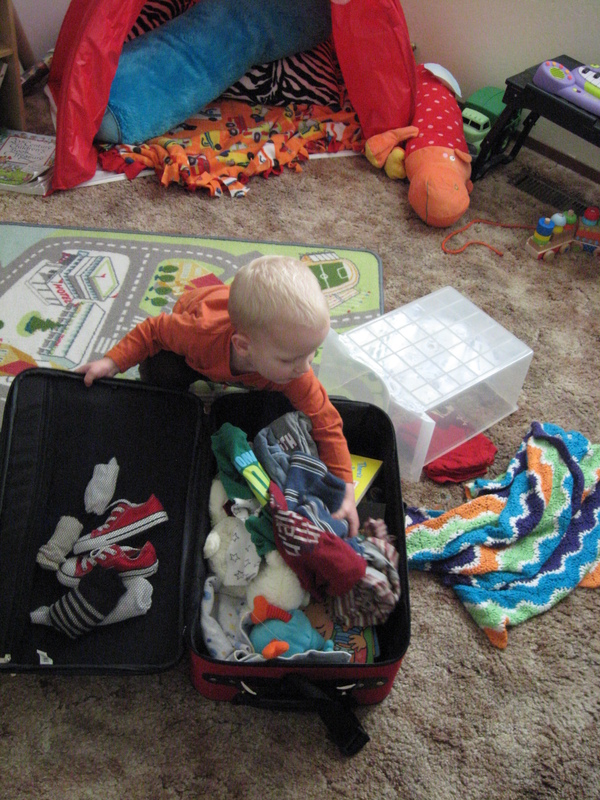 He loved packing for adventures, putting his clothes in the luggage, and getting ready to go. He was always “packed” long before Jodi and I, although usually this meant he had packed his whole shirt drawer, an air pump, a stack of books, and a few pairs of my socks. He would have loved the idea of packing his things to go on an adventure, and so this is the spirit with which we approached what we thought would be the most unbearable task. Caemon packing for a mini adventure. Naturally, there were items we wanted to keep, items we wanted to give to people we know, but having a purpose for Caemon’s clothes and knowing we would soon see photos of beautiful children wearing them, that they would be worn and worn and worn just felt so good. Knowing that Jodi and I–two moms without a child–were sending clothes to kids who don’t have parents felt positively right. There are still plenty of his things to sort through. Some of them we’ll sell at a moving sale in a couple of weeks, others we will hold for future children or gifts for kids we know, and certainly plenty of the new toys we will donate to the sorts of groups who donated them to us. His books we’ll keep–every last one of them because if you know what bibliophiles we are, you know that parting with a well-established library is virtually impossible. But it’s happening. The sorting, the distributing, the lightening of our burden is happening just as it should. I’m surprised that so far this hasn’t been an impossible task, that there is, in fact, some joy to be found in discovering Caemon’s treasures all over again. Yesterday, we found his stash of flashlights from the hospital, teddy bears that were covered in bandaids and various types of medical tape, even a couple of packets of “soothing Cavilon.” We rediscovered his “fellas”–the funny group of stuffed animals with which he used to have tea parties. We found artwork of Caemon’s, the music he so loved, and his beloved guitar. Discovering each of these helped me find some joy through the tears. 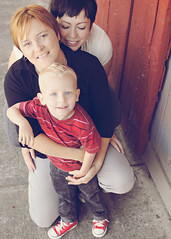 It helped me remember my son for precisely the wondrous child he was, and in that, I discovered a little bit of healing. We are by no means finished, but I am finding myself looking forward to spending more time in Caemon’s room seeing the little details of my quirky Caemon, sending more bits of his life out on adventures, and cherishing the many sweet memories of my beautiful boy. I know that there are going to be some more difficult moments, but cleaning up a child’s room is the work of motherhood. We fold clothes, place toys in their right places, and put books on shelves. We pack up the clothes that don’t fit anymore and sort through the toys, and when I look at this work through this lens, it is all so very natural: returning to these simple, almost automatic tasks, I’m allowed to remember a piece of myself I have been mourning as well, and that is such a gift. This entry was posted in home, mourning on April 2, 2013 by T.